Aeolus, God of the Winds, forgive me, for I have sinned. I have lust in my heart for a motorboat. In childhood, before discovering the quiet joy of sailboats, I was addicted to internal combustion. I built model airplanes and boats, partly for the pleasure of doing it, partly for the pleasure of flying and running them, but mostly to hear their little engines sing. Anything that burned methanol and spat castor oil in a cloud while it screamed at 10000 rpm suited me. My mother endured the noise patiently while I disassembled, rebuilt, tuned and tested these wonderful, tiny machines. Ancient outboard motors on scruffy rowboats got the same treatment. Run them, fix them, run them again. It was a happily misspent youth. Then came sailing, a life-changing event at age 13. From then until now, racing, cruising and daysailing under wind power defined my life. Tinkering with the auxiliary engines was a major pastime but not the primary goal. But time and events change things. An accident three years ago made it impossible to race, manage large sails or crawl around the cramped bilges of our beloved Ranger 33, Crescendo. It was time to get something age-appropriate. It was time to look for what old sailors call the Terminal Trawler. The last boat. I tell you that story so I can tell you this one. It’s a tale of kissing a lot of ugly statues in search of the entrapped princess. I knew pretty much what I wanted: a displacement or semi-displacement hull, single diesel or outboard engine, good construction, cruising accommodations for two, quiet running, between 26 and 30 feet. It couldn’t be ugly. I want to look back at my boat in the anchorage and smile. Frugality became a habit during our teaching years and it has served us well. Kathy and I are not about to sink a pile of money into a boat, and we pay cash for things. We see credit as the financial equivalent of the boll weevil. Having said that, we believe in shopping for value, which often means not buying the cheapest, but the most suitable thing. I expected to find a quality older boat in good condition in the $20,000 to $60,000 range. Since we also believe in having the smallest boat we can be comfortable in, that seemed realistic. We both wanted to keep as many of the advantages of sailing as possible, including seaworthiness and sea-kindliness, although I knew no powerboat in that size range would match the steady, quiet ride of a sailboat. In exchange, we would get more interior space, fewer physical demands and predictable speed. An online search turned up a prospect immediately. It was a Windy 26, built in Norway and located in Canada, with a price around $20,000. It was small but adequate, powered by a little Volvo diesel, beautifully built with endearing lines and in good condition. Suddenly, three more appeared in listings, surely the entire population of these little craft in North America. But we didn’t act quite fast enough and all four were snapped up. We would regret this for a long time. So, we began wandering around boatyards. Kissing ugly statues. Probing broken lives. Dismissing the undesirables. For two more years. I set Yachtworld.com as my default browser tab, and I put the word out to a few good yacht brokers. Derelict Mainship 34s, so-so Prairie 29s, too-small Nimble Nomads, shabby Albin 27s, salty-but-tiny Willards, weird custom one-off designs, unfinished project dream boats— all got rejected for one reason or more. The common age-related boat problems are easy to spot: water-soaked deck cores (common with teak decks), leaking windows, rusty water and fuel tanks, engine wear. All these are expensive things to repair since one thing leads to another. To replace tanks, you must first remove the engine. To fix the decks, you must remove hundreds of hidden screws that hold the teak boards. Flybridges posed a concern for us. I like them for the view and living space they provide, but Kathy has some physical limitations that make climbing most ladders difficult. One solution was a double-cabin boat, with two or three steps up from the side deck to the aft cabin top where there is a flat surface, and then a few more inclined steps to the flybridge. We also saw value in raised bulwarks all around the deck instead of low toe rails. I have spent many years clawing along decks of bouncing boats and want more security now. Then we stumbled upon The Deal. 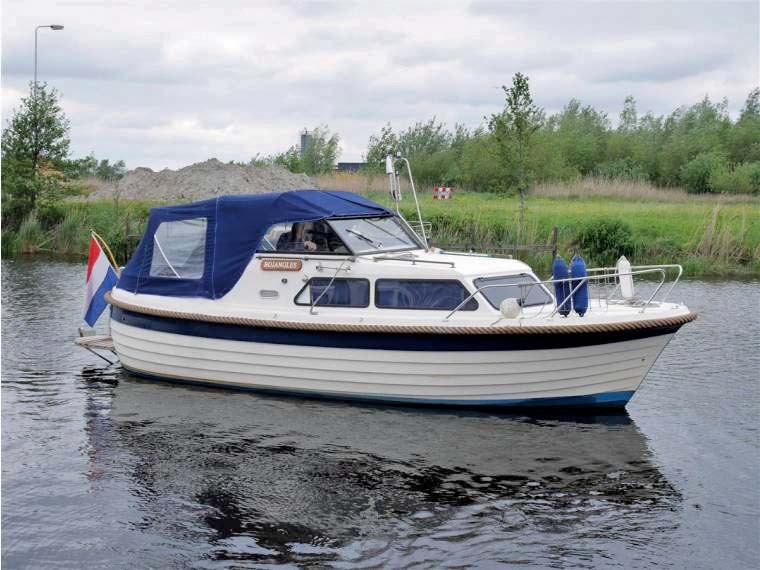 A 1979 Albin 33, in my home marina, came up for sale. The price was a steal. The layout was spacious. The engine was perfect. The boat was in pretty good shape but had the typical problems of Taiwan trawlers from that era—leaky windows, soft deck . . . Still, for the price, we could either put another $20,000 and considerable work into it and make it excellent or just run it for a few years as it was, living with a bit of shabbiness. Kathy’s shoulder and hand problem and an undefined uneasiness gave her a bad feeling about the boat. I’ve been married a long time, and I know that when my wife has an instinctive reaction it’s best to honor it. We backed out, deciding that it was a perfect choice for somebody 30 years younger with time to spend on refurbishing. And we regretted that for another year as nothing suitable turned up. How about a semi-displacement Downeast cruiser? They’re popular, they are fairly economical to run, and they provide speed if you need it to outrun the weather. I switched the search to include the Dyer 29, Albin 28, Cape Dory 28, Rosborough 246 . . . good boats all. We searched, we called, we traveled, we inspected. We regretted for several months not buying a clean 1989 Cape Dory 28 in Virginia Beach for less than $40,000 with a turbocharged Volvo engine and no flybridge. Then we took a test ride on a recent model Albin 28. Within minutes, I found it tiring, the whine of the turbocharger pierced Kathy’s hearing sensitivity and we declared the ride was over. Not the boat’s fault. Okay, no turbocharged boats, normally aspirated engines only. That’s less maintenance and better fuel economy, anyway. Slow suits us better than fast, and a 50-mile cruising day would be just fine. Back to trawlers. We upped our length limit to the 30- to 33-foot range to get the speed and accommodations we liked. That opened a host of new possibilities, including the vintage Taiwan trawlers like Marine Traders and Albins, plus the Singapore-built Grand Banks at the top of the quality scale—and also the price scale. We drove 300 miles to check out an Island Gypsy 36 with twin engines and old tanks but a price well under $40,000. The layout was nice, the construction good and flybridge access excellent, but I was not ready for its size, twin-engine complexity, and condition, and I didn’t care for the exposed side decks and foredeck. Kathy liked the aft cabin and regretted not buying that boat for a couple of months. We drove 150 miles to see a 1986 Grand Banks 32, a design I had studied extensively. I liked the basic boat but not that example, which not only had bad decks but was priced at $70,000. Neither of us regretted walking away. Meanwhile, a restored 1978 Grand Banks 32 Sedan popped up on Yachtworld.com at a fair price. A broker I knew and trusted said it was a good one, and it had a recent survey. We were off to south Florida. This boat checked all the boxes: new diesel, new fuel and water tanks, fiberglass decks instead of teak, good canvas, new prop and dripless coupling, Awlgrip paint on the hull and cabin, tight windows with no leaks, sizable battery bank composed of six-volt golf batteries. The owner seemed to think the way I do. There was no anchor windlass, and the autopilot was old and marginal, but a recent GPS chartplotter was part of the deal. A serviceable Avon dinghy with a small Honda outboard were included. The fridge and stove were like new. The boat had a generator and air conditioning, not requirements on my list but nice to have. The surveyor’s report was positive except for a few minor points. The owner had bought this boat from the renovator six years earlier and continued with careful maintenance and upgrades while cruising almost 200 hours per year for a total of only 1,240 hours on the American Diesel (Ford) 140-hp engine. The exterior teak shone and the interior was clean and lovely. The bilges were dry and clean. This was it. We settled on a price in the low $50,000 range and prepared for the next phase of our cruising life. Ten days and 450 miles of cruising in Florida have shown us that our Grand Banks 32 (#599) is comfortable, relentless in the face of 25-knot winds and chop, and easy to handle. She burns about 1.5 gallons of fuel per hour while averaging seven knots. I think she’s a handsome vessel. Kathy thinks she’s pretty but resembles a cute bathtub toy from a distance. Being back on the water is a physical and psychic renewal. We can hardly wait to get her back to the Chesapeake. Her new name is Snowbird.